Well folks, since it’s almost the weekend I have another feel-good tear-jearker of a story for you again (and I really mean it, this one is a doozy). So sit back, relax, and prepare to bawl your eyes out. Yet another adorable doggo has been found abandoned in North Carolina during Hurricane Florence. Honestly… I don’t know who these people monsters are that can sleep at night knowing they’ve left behind their own pet to pretty much drown, but whoever they are they better hope that they never run into me down an alleyway on a dark night, that’s for sure! Anyway, this story isn’t about the evil, heartless people of this world, but of the kind, loving and brave people who put their own lives at risk in order to help those in need, especially when those in need have four legs, a wet nose and a waggy tail. 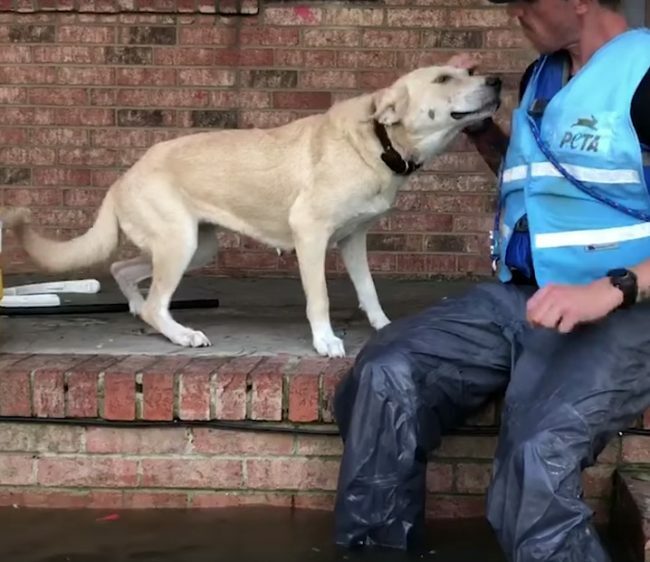 It’s also about how happy this good boy was when these people came to rescue him from the rising flood waters of Hurricane Florence. The poor, terrified male pooch was found in North Carolina by PETA this passing Monday (September 17) after being cruelly abanadoned by his owners as they fled the torrential and increasingly dangerous weather of Hurricane Florence. 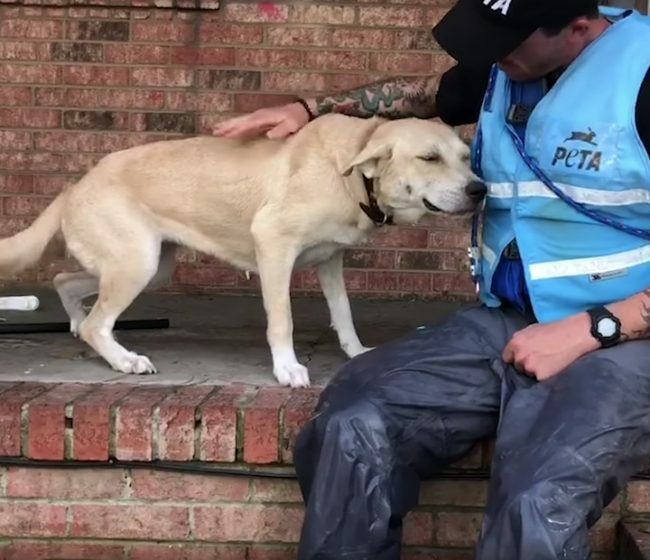 Luckily for us, the heart-warming moment was caught on camera and uploaded onto the PETA Facebook page, and I promise when you see the pure, ecstatically happy look on this adorable pups face when he’s being rescused, the floor gates will open and you will be crying for days. You have be warned. 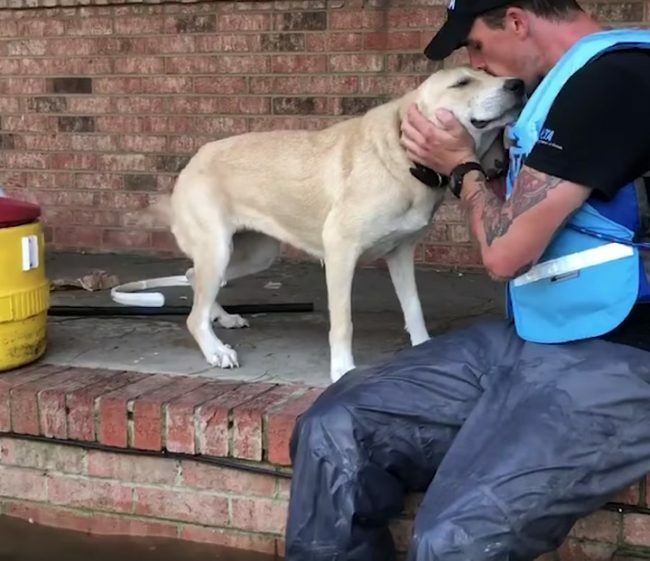 The pup was found trapped outside his home in Lumberton, where the River Lumber had recently burst its banks due to the ever rising flood water and the town quickly became waterlogged. The flood waters were getting so high in fact that it actually started lapping at the raised porch where the scared dog was running back and forth. You can clearly see it is also completely covering the wheels of the car in the driveway. At first you can see he is weary while approaching his rescuer, and seem terrified and extremely cautious, yet was still wagging his tail with happiness as the rescuers appeared and began to show him well-deserved love. The PETA team then took the abandoned dog to a staging area which the emergency workers had set up and afterwards he was moved to a nearby shelter. Honestly, it truly truly perplexes my mind that somebody could actually abandon their pet and leave them to fend for themselves in such terrible conditions. Truly, truly heartbreaking. There’s definitely a special place “below” for anyone who would do such a thing. But forget about them, let’s focus on the happy little tail-wagging doggy who is now in a much safer place with people who will take care of him properly, the way he truly deserves.